Toward the end of 1979’s Mad Max—the film that launched Mel Gibson’s career, and for two decades held the record for highest budget-to-profit ratio in history—there’s a shot that still stands as a marvel of action filmmaking, a remarkably adrenal and dizzying feat. Keeping this spoiler-free (hey, 36 years isn’t that long): The shot comes during a climactic high-speed chase, the moment Mad Max has been building to. The camera is flush with the speeding pursued, the Australian highway extending behind the cars like a long black tongue. Suddenly, with vertiginous speed, the pursuer comes barreling forth. It feels fast; it looks faster. By the end of the shot, any question of superiority or confusion about the outcome has been undone. We know how this is going to end. While this shot is just one of many that put Mad Max among the greatest action thrillers ever made, it’s notable for another reason. There are two ways to define a Golden Age: by abundance, or by quality. Going off the former, this is a Golden Age for action movies, with the industry hinging on superhero sagas and young-adult franchises that both involve annihilation on a comically large scale. Judging by the latter suggests a different story, one that’s comical in a less-ideal way. Because of the precedents set in various strains of the modern blockbuster—The Avengers for Marvel, Man Of Steel for DC, and the Transformers movies for Michael Bayism—action filmmaking has come to mean destroying things. Buildings? Cool. Planes and trains and automobiles? Sure! Entire cities? Yeahhhhhhh! The stage is unequivocally massive, which should make the stakes high. But the opposite has been true, on a systemic level. With the stakes always at world-war levels, audiences have grown used to apocalypse. With action filmmakers taking an urban planner’s worth of territory as their playing field, they’ve robbed themselves of essential inertia. Perspective has been abandoned. Instead, action films have chaos, with a million cardboard bad guys flying in every direction, the protagonists thrown in the middle so they can claw their way out. It’s nearly impossible to follow action scenes in this style, because there’s nothing to follow. When every element of the scene is in constant motion, irrelative to one another, it feels like nothing’s moving. There have been exceptions. Like the zombies in World War Z, assaulting the walls of Jerusalem, framed so they look like a single creature. 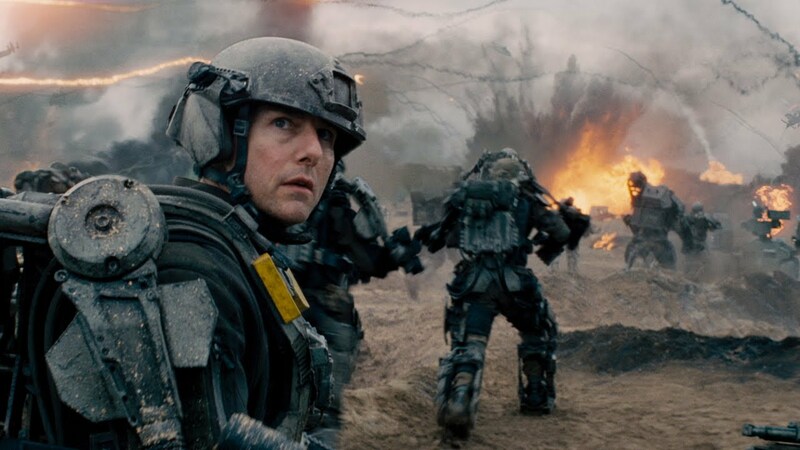 In Edge Of Tomorrow, as battles rage around Major William Cage, the camera shares his bewildered perspective. In these movies, viewers are constantly grounded in someone’s experience, whether it’s the direct protagonist, or a daunting God’s-eye view of what’s going down. There’s a method there, a deliberate sense of style. But the kinds of blockbusters that prioritize an original and coherent aesthetic are the odd ones out. It’s much more common to create as much mania as possible, then throw the camera in. Mad Max, which has just been re-released on Blu-ray, is different from World War Z and Edge Of Tomorrow in a dizzying number of ways, particularly in terms of budget gap. First-time feature filmmaker George Miller made Mad Max on a $350,000 production budget; Edge Of Tomorrow cost $175 million, and World War Z’s production budget shot from $150 million to $190 million. And neither offers what Mad Max has: a blueprint any writer or director can follow in hopes of making a great action movie. Above all, what makes Mad Max special, and so unique among today’s movies, is that it looks completely distinctive. 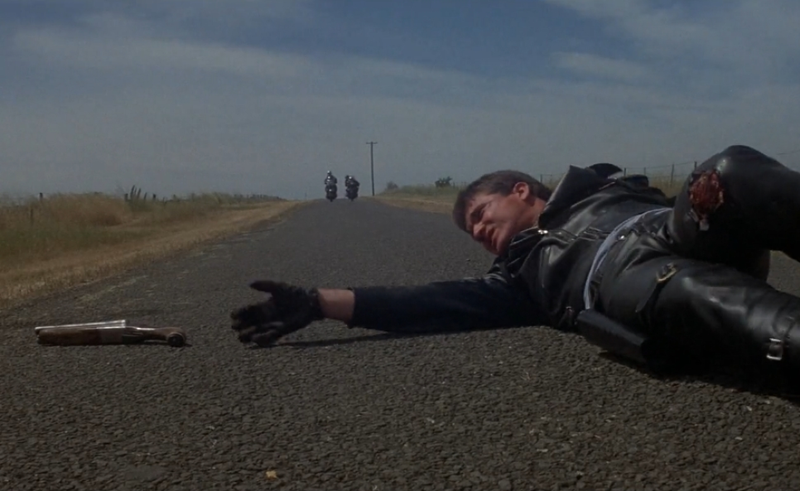 Every scene tries to offer a new surprise, whether it’s the opening chase that saves Max until the very last moment, or when Toecutter’s motorcycle gang, the movie’s main antagonists, ride into a quiet town and spin up like a tornado, or the details of the gang, like their mod outfits and their skeevy accents. Or for that matter, how Max’s ramshackle Main Force Patrol, an outfit that’s never narratively explained, seems to exist in no better circumstances than the gangs do: Patrol members occupy some rundown old building, and show plenty of their own derangements. It’s nice to have a dystopian setting as a license to create anything, but what matters in Mad Max isn’t the fact that it’s set in the future—it’s the way every element of that future is meticulously curated. Miller didn’t have much money, but he made his action look astounding by focusing on clarity. The greatest chase scenes in cinema, like The French Connection’s train scene, or more recently, the L.A. pursuit in Nightcrawler, all have deliberate, choreographed development in common. While these scenes are unfolding, they feel fluid. But afterward, they can be parsed into stages, steps that eventually lead to a destination. It isn’t the stages themselves that make the scenes thrilling; instead, it’s having that evolution coded into the arc of the scene. Even if you don’t notice that arc as it’s happening, your brain senses it, and you move alongside. Mad Max does an astounding job of letting action evolve, with each chase proceeding through its own beats. The sheer number of stage-to-stage scenes over the course of the movie is astonishing. They don’t have to be car chases, either: when Max goes into the woods after the Toecutter gang, and they flank him by cornering Jesse, Miller progresses the same way, with that same sense of unsettling buildup. Then there’s the question of stakes. Mad Max seems narrow in summary: There’s a dystopian nightmare state, but the movie doesn’t explain why it is the way it is, or what’s happening in the rest of Australia, let alone worldwide. There’s no grand conspiracy or massive criminal organization: Toecutter’s gang barely numbers in the double digits, and they don’t seem to have a plan beyond terrorizing randos. The victims viewers are meant to care about are Max’s closest friends and family. What should be a small film becomes agonizingly large through that intimacy. Saving the world is such an abstract concept, it’s basically math. But saving two people, or avenging them, is a frightening, starkly simple yes-or-no process, and the few antagonists that do exist come to stand in for an essential evil. The grand effect of all these factors is a movie that hits hard, with a focused, direct hammer impact. This monomaniacal small-scale focus isn’t the only way to make movies, by any means, though the tradition lives on in indie circles, with recent, terrific efforts like Blue Ruin and The Guest. But with so many of our culturally significant films so far-flung in what they’re after, and so hectic in how they go after it, Mad Max is a reminder that there’s another method for making a profitable movie. And that method is still funny, colorful, and kaleidoscopic in its ambitions.